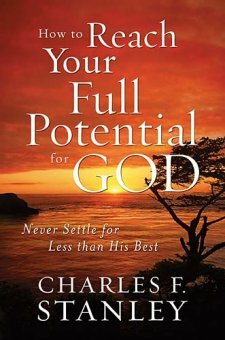 I finally finished reading the book "How to Reach Your Full Potential for God" written by Dr. Charles Stanley and here is a brief book review. In this book which I would say is perfect for those who want to get more out of life and for Christians who feel dry, Dr. Stanley shares the key elements a person must have in his or her life life to become who God has called him or her to be and fulfill all that God has planned for his or her life. He calls these key elements as “essentials” that can point a person in the direction of a life that is full of peace, joy, love, and abundance. The essentials he wrote in "How to Reach Your Full Potential for God" about are having a clean heart, a clear mind, discovering the gifts God has equipped a person with and how to use them. Dr. Stanley also shares practical life applications like eating healthy, exercise and time management. This book deals with important aspects of life: the spirit, soul, and body and explains that all 3 must be congruent and balanced so that a person can reach his full potential for God. I highly recommend this book to seekers, those who are uncertain about God's calling for their life. Dr. Charles Stanley addresses how a person is created for a purpose, and that purpose is only found in functioning in this life the way our Creator designed he or she is to function. I like the very practical and encouraging approach of Dr. Charles Stanley in his book "How to Reach Your Full Potential for God."